The first two symphonies of Sinding, which I reviewed some time ago, did precious little for me, so this was a very pleasant surprise. The third symphony opens with a sort of brazen splendour, a leaping, exuberant theme which is contrasted with a long-breathed, rather Tchaikovskian second subject. This first theme, together with Sinding’s inventive counterpoint, is well able to sustain the momentum of the movement which actually seemed to me much shorter than its 13’ 45”. The luxurious slow movement has themes of a less well-defined cut, but always seems to know where it is going, as does the scherzo which, with its ceaseless redecorating of its themes, suggests continuous variations rather than a traditional scherzo and trio. The finale comes close to quoting “Die Meistersinger” at a couple of points but it avoids the four-square heaviness which often spoils jubilant finales and concludes with nobility and power a symphony which, had it been written about thirty years earlier, might well have entered the repertoire. Sinding was 63 when he completed this work, which he seems to have intended as his chef d’oeuvre. A further symphony was begun in 1921 but he wrote little in his later years and finally put the fourth symphony into shape for his 80th birthday celebrations in 1936. It marked a new departure for him in that it was divided into seven sections, illustrative of a poem of his own composition. Though Sinding seems to have been in some doubt as to whether it was really a symphony or a rhapsody, his sense of musical movement, as well as his handling of the Wagnerian-Straussian orchestra, remained unerring and the work is far from a romantic sprawl. Its warmth and sheer exuberance certainly reflect the coming of spring while there is much warm-hearted writing in its slower movements. 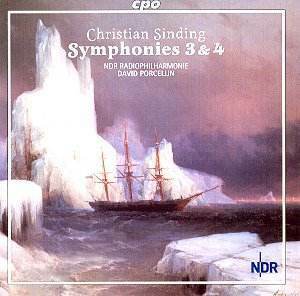 I think that, if Sinding achieved a masterpiece with any of his symphonies, it has to be no.3 on account of its superb first movement and generally stronger thematic profile, but no.4 is well worth knowing. If you are encouraged by my words to buy this, let me point out that you are unlikely to find any particularly Norwegian voice here. Sinding embraced whole-heartedly the ideals of German culture – to the extent of expressing publicly his support for the Nazi movement in 1933, alas – and the chief inspiration behind his music was Wagner, particularly “Die Meistersinger”, from which he inherited the orchestral luminosity and contrapuntal life rather than any Teutonic heaviness. By 1920, the year in which Nikisch gave the first performance of the third symphony in Leipzig, Sinding had come to seem rather old-fashioned, but this need not worry us today. If you enjoy the music of Pfitzner and Reger, I think you will enjoy this disc. For some reason there has been a change of conductor for the completion of this cycle (the first two symphonies were impressively conducted by Thomas Dausgaard) but since the Dutch conductor David Porcelijn is equally convincing, as well as having better material to work on, we need not complain. The notes are very detailed, the recording warm and well-balanced, and the cover reproduction of a painting showing a ship among icebergs is about as far removed from the warmth of the music as could be imagined.